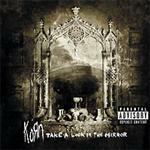 Korn returned in late 2003 with their 6th album, "Take a look in the mirror", to a slightly muted reception. While the album is perfectly mixed, the production sleek and the cover of the thing amazing, the songs are in need of tinkering. Korn sludge through many an anthem, loud choruses, biting vocals and whatnot, but they've done this so many times before. Only on first single "Did my time" are they actually any interesting, with a dark and gothic metal style. This does not bode well, Mr. Davis.